In London you can probably find all the world's food. There are Chinese, French, Italian, Greek, Spanish, Asian and especially Indian. It´s almost a must to try Indian cuisine when you are here. Would you like to try some English food, why not visit a local English pub. Would you like to eat a bit more stylish - visit one of the restaurants listed in the Michelin Guide. 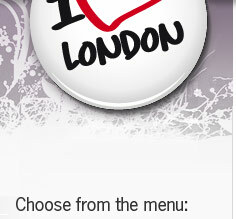 Some tip about restaurants in London! Yes, the name is Burger and Lobster and this is what the serve. So it is not so hard to decide what to eat when it is just burger or lobster to choose from. The dishes are served with fries and salad. This is a chain that you can find all over the world such as New York and soon also in Stockholm.. 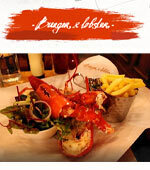 In London you find Burger & Lobster at several places such as: Soho (36-38 Dean Street), Mayfair (29 Clarges Street), Oxford Circus (6 Little Portland Street). 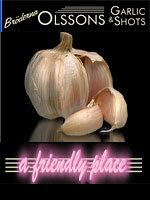 Here you should you go if you love garlic. All dishes are served with garlic. They serve appetizers, salads, tapas, fish, meat, noodles, pasta and even some sweets with garlic in. How about Ohlsson's garlic meatballs or smoked sausage garlic Småland. There is a bit mixed to choose from. Restaurant also in Stockholm. The Swedish restaurant serves also shot in very different flavors. Would you like to visit the restaurant as Jamie Oliver started, please visit the Fifteen. Here are also trained young people who want to enter the restaurant business. They serve breakfast, lunch and dinner. They say you should book a table. Address: Westland Place, NI, t-bana "Old Street"
The restaurant is located in one of Soho old buildings at the time was Carl Marx a tenant here. Bar and restaurant on the ground floor and members' club upstairs. For those of you who like fish and clams, this is a place to go. If there is a lot of people it can sometimes be a bit loud in the restaurant. Of course, you have to eat Indian when you are in London. 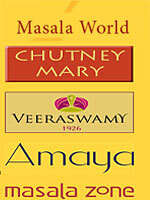 Masala World chain has many different restaurants in London. We tip you of one which we are not far from Piccadilly Circus. Here you can get delicious Indian food. 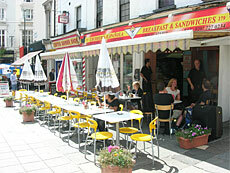 Received the prize Restaurant of the Year in 2005. Do you want to visit a fancy London restaurant founded by a celebrity. Please visit and Gordon Ramsey's restaurant Murano. The food is delicious and the service likewise. Please be aware that they have dress code! When you are in London, you should also try Chinese food. Go to Chinatown, there you will certainly find a restaurant -:). 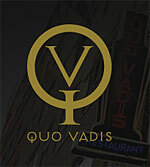 Here is dotted with various restaurants, we just say, be spontaneous and test. Most often it strikes not wrong. 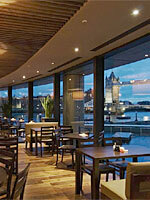 Here you can eat Asian food and enjoying views over Tower Bridge, not wrong! Decent prices and good food. The atmosphere is not wrong. Sometimes it can be crowded, to be sure that you should come in, is to reserve a table. Here you can eat dim sum, they have a noodle bar where you can combine your own ingredients and sauce. Or why not try their Thai Green Curry. 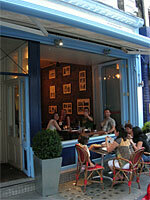 If you are in Covent Garden, you can dine at the Brasserie Restaurant Bouelvard. When we were there we ate dinner in the evening. It was a hot summer day and they had opened the window facing the street. Very good food and friendly staff. Good food at fairly good prices. The restaurant opened 1991. It is not far from Covent Garden Piazza and Royal Opera House, not far from the two theaters Lyceum Theatre & Theatre Royal. If you're in East London, go to Brick Lane. 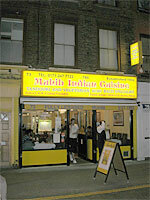 There are many restaurants with Indian and Pakistani food in the same street! We found "Mahib Indian Cousine" - the room is long and narrow with typical Indian decor. Drapes and everything that belongs to. The first question we get is: Do you want some papadum? They are suitable as starters for the beer. Together with a strong tasty dip. The food was good at nice prices. If you are in the western parts of London and go to the station - Bayswater - may we recommend a Spanish place where we ate breakfast. 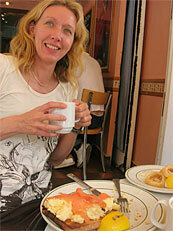 The staff was really nice and breakfast was absolutely delicious. Everyone was really hungry so we ordered everything we could think of. Toasted sandwiches with scramble egg & smoked salmon, calamares, egg & bacon, coffee, cappuccino, juice, and finally we were pushing down their bespokne Croissants. After that we were stuffed! 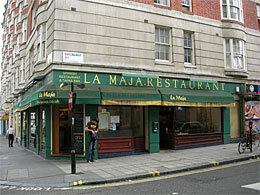 Do you like tapas, you can visit la Maja Here are common tapameny in an environment that is Spanish-inspired. You can also order paella. Of course, they have a wine list of Spanish wines and even beer for those of you who like it. Prices are medium. 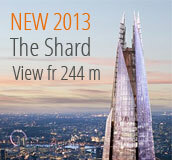 Located in the western part of London. 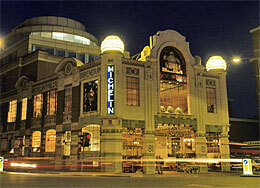 about 15 minutes walk from Harrods you can find Michelin House. Michelin began his Michelin tire shop 1911. It is a beautiful building designed by one of Michelin's own engineers. The house is in the Art Deco style, the stained glass, colorful windows are based on the Michelin ads from that time. When Michelin moved its activity in 1985, it became instead a lovely restaurant and oyster bar. The first room is tiled and is decorated with the famous race course, the cars have Michelin tires. Our friend Charlotte tips that you can take a lunch, a glass of wine or a few oysters on the Bibendum Oyster Bar & Restaurant in Michelin House.